In the late 18th century a Scot by the name of James Boswell wrote a detailed biography of Dr Samuel Johnson, a game changer in the world of literature. With a similarly innovative leap, in the late 20th century a German car company created the first modern sports car, the Porsche 924. What makes Boswell's Life of Samuel Johnson famous isn't that it is the best biography ever written, simply it was the first modern biography and paved the way for hundreds of years of biographies in a way that is difficult for our modern heads to understand. Boswell's masterpiece wasn't just a great work of literature, it was to the art of biography similiar in impact to Aristotle's contribution to logic, St Augustine's impact on Christianity or Yoda's legacy on the Jedi. What car could possibly live up to the crescendo we've created? Simply, the worlds first modern sports car, the Porsche 924. 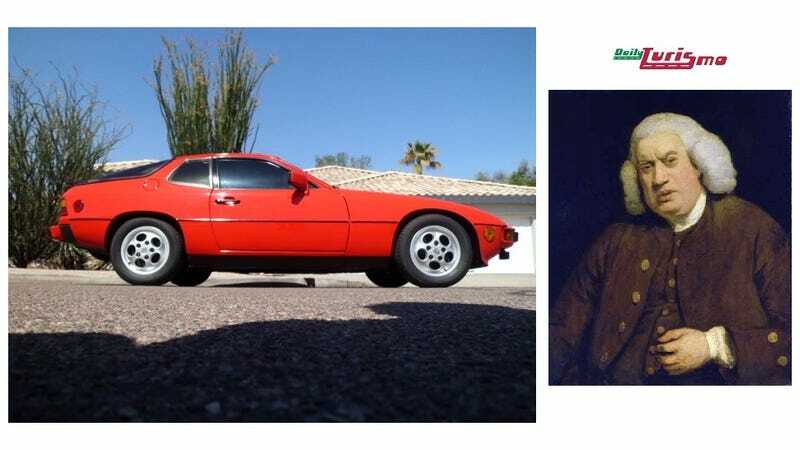 Find this 1987 Porsche 924 S for sale in Scottsdale, AZ currently bidding on ebay for $4,015 with 7 days to go. Similar to Boswell's seminal work, the Porsche 924 isn't the best sports car ever built, in fact by today's standards it is quite slow and horrible. However, when introduced in 1976 there was nothing like it on the road. Certainly there were faster cars and cars that could set a higher skidpad figure..but sit in a 924 today and it feels like a modern car, something you can't say for an early 911, 70s Corvette, Mustang, any Ferrari, 70s Alfa, Volkswagen Beetle...etc. The steering feel is crisp and on-center, the brakes work like modern cars and most importantly, when you huck it through a set of autocross slalom cones it doesn't feel like you are trying to ride a bull through a cactus patch. The early 924s were powered by an Audi sourced engine that won't ever be accused of being too good, but by 1986 the 924 was powered by a 2.5 liter Porsche inline4 taken from the 944 line. This 1987 Porsche 924S uses the 2.5 liter Porsche inline-4 and puts 150 horsepower into the rear mounted transaxle. Inside the 924 the driver is greeted with a low seating position with excellent relationship between pedals, steering wheel and shifter. Really, you'd be hard pressed to guess that 924S was built in the same era as the C3 Corvette, AMC Pacer, and Mustang II. Life isn't all fun and games owning/driving a Porsche 924, as they are now 30-35 years old and maintenance can be shockingly expensive, but when compared to its contemporaries, the 924 stands out as something that will start every time like a modern car, not need time to warm up and give you a combination of comfort and sport that every automaker has been improving on year by year. It isn't the best modern sports car, but like a rare print of The Life of Samuel Johnson, a copy belongs on your shelf.